Tablighi Jamaat Bishwa Ijtema 2010, began Friday, January 22, 2010 on the bank of the river Turag in Tongi with participation of about 2 million people including over one lakh women from home and different countries.Muslims from various place of Bangladesh came to join the Bishwa Ijtema 2010. Tens of thousands of muslim with winter clothes and blankets and cooking tools from across the country have gathered at the Bishwa Ijtema place, which is 20km north of Dhaka city, to seek the divine blessings of Allah.According to the Bishwa Ijtema organisers Around 9,000 Peoples from various countries have arrived while many are on their way to contribute in the three-day Ijtema congregation.The number of devotees will increase on the day of Akheri Munajat(final prayer) on January 24. Tablighi Jamaat Bishwa Ijtema really a popular muslims congregation of the world. 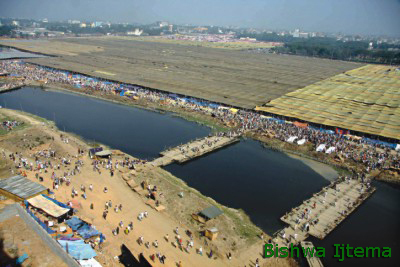 Peoples all around the world know about the Bishwa Ijtema Tongi. Now Bishwa Ijtema is a familiar word to all muslim and non-muslim people of the whole world. In Bishwa ijtema peoples come to hear sermon delivered by different maulana indicating the practical Islamic life of muslims according to the Quran & Hadith.The sermon(Bayan) is also popular to all.The muslims who did not participate the Bishwa Ijtema 2010 can be Listen the Ijtema Bayan(sermon) now.